The HIX 36 Inch Washout booth is the big brother of the 32 Inch Washout Booth, and employs the same innovative multi-part system that allows them both to be disassembled and shipped via UPS ground in one box. With an extra four inches in width and five inches in height, and provides additional room for standard 23 x 31 inch screens. 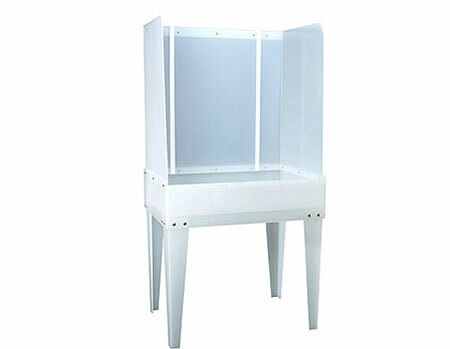 And like the 32 Inch Booth, the 36 Inch Booth is made of durable, chemically resistant 1/4-inch natural poly and features built-in screen supports and a perforated drain. The HIX Washout Booth is an excellent addition to any clean-room. And because it is semi-transparent, backlighting can be added by the customer if so desired.